PRINCETON, NJ -- Americans have a distinct sense of priorities for issues facing the nation in the next year, with more saying it is extremely or very important for the president and Congress to address the economy than any other issue. In addition to the economy, education, healthcare policy, Social Security, and terrorism are issues at least 70% of Americans deem important. These priority rankings are from Gallup's annual Mood of the Nation survey, conducted Jan. 5-8. 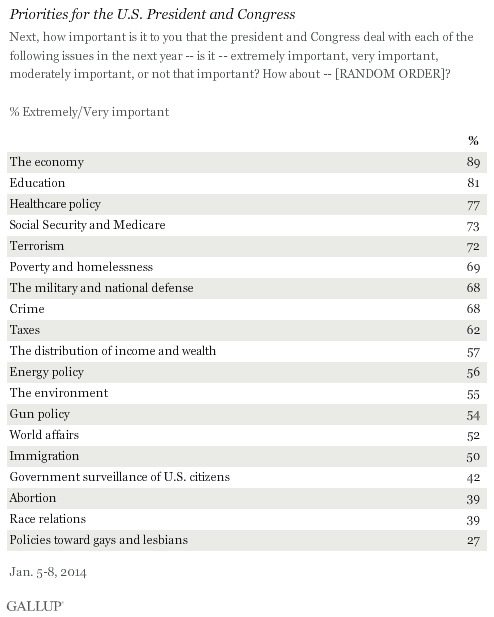 Americans' importance rankings extend from 89% for the economy to 27% for policies toward gays and lesbians. In fact, the three lowest-rated issues are social policies -- the other two being race relations and abortion. Americans also give government surveillance of U.S. citizens a low priority rating, despite the continuing and controversial revelations about the data-snooping actions of the National Security Agency. Americans assign a higher priority to "poverty and homelessness" than to "the distribution of income and wealth." This suggests that this current hot-button issue for President Barack Obama and other elected officials resonates more with the public when it focuses on those at the bottom end of the spectrum rather than on wealth distribution across the whole population. Gallup has previously reported the wide range of satisfaction levels Americans have with the status of these issues in the U.S. today. The juxtaposition of these two ways of rating the list of issues -- satisfaction with the status of the issue and the issue's priority for the president and Congress -- provides a unique perspective on how Americans view policy priorities. The accompanying graph maps each issue on Americans' relative level of dissatisfaction with it (the vertical axis) and their relative priority for it (the horizontal axis). Americans express above-average dissatisfaction with six issues to which they also give above-average priority ratings for the government, making these the issues that Americans presumably would want their government to focus on most immediately. The economy stands out among this group -- it's one of two issues about which Americans express the least satisfaction, and is the single issue with the highest priority rating. Other issues in this "high focus" quadrant are poverty and homelessness, taxes, education, affordable healthcare, and Social Security and Medicare. Americans assign high priority to four issues with which they are generally satisfied -- reflected in their below-average dissatisfaction scores. In other words, the public believes these issues are under control at the moment, in essence saying, "Keep up the good work." These include the quality of medical care, terrorism, the strength of the military, and crime. Americans are dissatisfied with four other issues to which they give below-average priority for the president and Congress. Importantly, these include government surveillance of its citizens -- an issue about which Americans express dissatisfaction, but also one to which they give a lower priority. Others in this group include gun policy, world affairs, and immigration. Finally, there is a group of issues about which Americans express relatively low dissatisfaction but at the same time low government priority. Clearly these are issues that Americans believe deserve the least government focus at this time. This group includes race relations, the environment, gay and lesbian acceptance, energy policy, and abortion. The economy tops the list when Americans are asked how important it is that the government in the next year address a series of issues facing the nation -- and it is one of two issues about which Americans express the greatest dissatisfaction. The economy thus remains the single issue out of 19 tested that Americans would be most likely to entreat their government to deal with. Five other issues are also in this high-focus category, given that the public is dissatisfied with them and assigns them a high priority: poverty and homelessness, taxes, education, the availability of affordable healthcare, and Social Security and Medicare. The public appears to be relatively satisfied with the quality of medical care, the military, efforts to fight terrorism, and crime, but the importance assigned to each of these suggests that they should continue to be a government "maintenance" focus. All other issues tested have below-average priority, albeit with differing levels of satisfaction. Of these, perhaps the most notable is government surveillance of its citizens. Americans are dissatisfied when asked about surveillance, but at the same time do not see that it should be one of the most important priorities for their government. 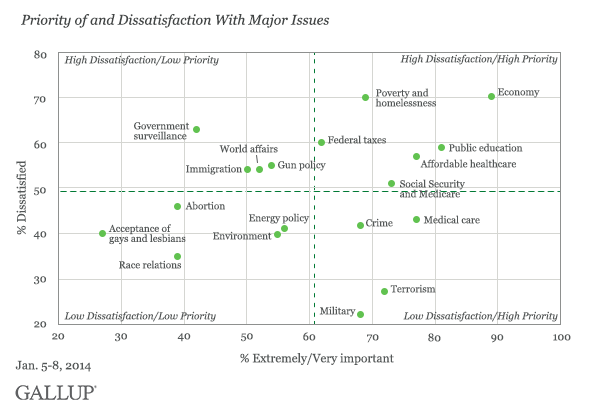 The two hot-button issues of immigration and gun policy also fit into this high dissatisfaction/low priority category. Results for this Gallup poll are based on telephone interviews conducted Jan. 5-8, 2014, with a random sample of 1,018 adults, aged 18 and older, living in all 50 U.S. states and the District of Columbia. More Americans today are satisfied with where the nation stands on acceptance of gays and lesbians, federal taxes, and healthcare availability than were satisfied in 2001. But Americans' satisfaction with the economy has declined. More Americans say they are financially worse off now than a year ago, reversing the modest improvement this measure made over the past two years. The government itself leads Americans' list of the top problems facing the U.S. in January. While mentions have fallen from the high during the October government shutdown, they remain elevated, at 21%. The economy follows at 18%. Gallup editors compile big findings from the 2017 Governance survey, examining how the U.S. is being governed and how it might be improved.